The task of starting a whole new profession in the world of real estate is not easy to accomplish. A whole lot of information can prove to be overwhelming for all new real estate agents. Advice and suggestions start flowing from all directions, while they struggle to make a stable footing in the complex real estate industry. The information, tasks, and requirements can possibly awaken a new fear in the new agents, but with proper knowledge and correct tools, real estate can become a simple task to handle for the rookie agents. 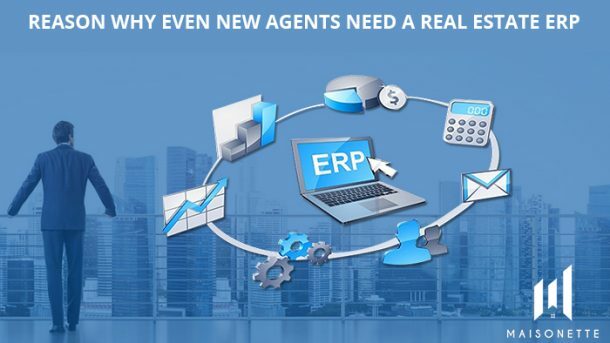 One of such tools that can help in making the responsibilities of new agents simpler is by the use of commercial property management software, such as, a real estate ERP software. Starting a new business is never easy, hence it is essential for the agents not to let their business slip into the world of organizational chaos. The misplaced contacts, information scattered at all places can prove to be hazardous for all, especially the new agents. Contact information management is the most significant benefit of commercial property management software. Using the database of the ERP software, various groups can be created for direct access to the data. The Detailed portfolio of clients can be designed to eliminate the complexities of the business. Instead, use a real estate ERP such as Maisonette, the best property management software to house all your contacts in one place. Maisonette makes the task of handling contacts easier and smoother. Along with new clients, ERP software helps in maintaining contacts with older clients as well. Commercial property management software ensures most extended client-customer relationships with minimal efforts. As a rookie agent, generating many repeated or referral business is not usually possible. Hence, nurturing every lead and prospect is vital for the growth of the company. A commercial property management software, such as a real estate ERP such as Maisonette is perfectly equipped for helping the new agents in handling all similar tasks. With pre-written drip campaigns, nurturing the leads becomes an easier task, ensuring that you are staying on top of mind with your prospects and converting them to clients. The real estate ERP software offers an excellent boost to a fledgling business! For every rookie agent, potential clients make in-depth research on them. Hence, online presence is critical for all new agents. The new real estate agents need to maintain a presence on both social media as well as website. These requirements can demand extra time, and money investment that new business can’t afford, but not with Maisonette handling the site and the whole business process becomes more natural. Apart from these online presences, the new agents need to avoid making any mistakes while drafting leases and other official documents. The in-built document feature of Maisonette helps the new agents avoid any inconsistency. As a new real estate agent, your focus needs to be on building relationships. A real estate ERP such as Maisonette Holding offering best property management software for all real estate agents can help you in keeping your business look professional, organized, and become the expert of the business you own.